Watched On: The Silver Screen! I have no idea why critics are down on this movie so much, because both the Missus and I enjoyed the heck out of this movie. 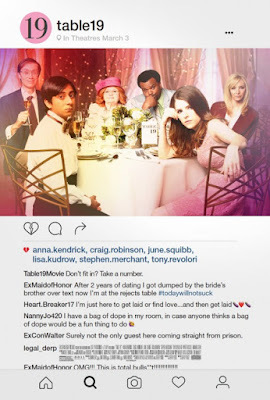 Anna Kendrick stars as Eloise McGarry who is invited to a wedding at sat at Table 19, the table in the furthest corner, full of people that the hosts had really hoped would not bother to attend. Eloise is angry because in coming to the wedding, she has to see her ex-boyfriend, Teddy again, who has recently dumped her for Nikki who took over Eloise's former position as Main of Honor in the wedding. As she's loitering outside the entrance to the reception hall, a tall, dark and handsome looking off-brand Hemsworth Brother (actually, he's not a Hemsworth Brother, but he looks like he could be one.) flirts mysteriously with her, but she blows him off and eventually meets the rest of her table. Then the movie sort of turns left in way that you don't see coming. I'm not going to tell you what it is, because it'll totally spoil the movie, but it is a hard left turn and it's actually kind of refreshing. I guessed what the deal with The Off-Brand Hemsworth Brother was and in any other movie, that would have been the obvious direction to go. There would have been some comedic hijinks and some usual rom-com tropes and then that would have been the end of it. That movie, I could understand getting a critical drubbing. This movie avoids the tropes though and it works- because instead of plodding through the trappings of literally any other wedding comedy that you've ever seen, the occupants of table nineteen actually find out about each other and get to know each other and realize that they've all got problems and if they're going to be the table of unwanted misfits they might as well own it. That realization actually helps all of them to solve their problems and the movie ends happily. Not in the way you were expecting, mind you. But it's certainly a happy ending.